Best Pirate Book Ever! OK, so I’ve said that before, but there’s just something magical about children’s pirate books. So many adult-oriented pirate books get bogged down in things like murder, scurvy, moral and legal issues, and all that nonsense. But quite often a good children’s book comes along and reminds us that historical fact notwithstanding, pirates are COOL. Period. So yeah, I love pirate kid’s books, and this is especially true when they’re well written and beautifully illustrated. This one is both, and then some. Jeremy Jacob is just a young lad making sand castles on the beach when he’s asked to join Braid Beard’s crew of fearsome pirates. Jeremy then learns the ups (no need for table manners) and downs (no tucking in or good-night kisses) of pirate life as they do everything from sing sea chanteys to weather storms. 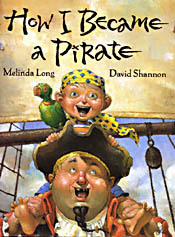 The illustrations are tremendous and deptict a rag-tag pirate crew of the goofiest cutthroats imaginable, complete with parrot, kitty, and even a pirate with two eye-patches. But the real star of the imagery is Jeremy Jacob’s wide range of facial expressions – they practically tell the story on their own, from his first awe-inspired look at the pirate captain to his final triumphant smile as he leads the pirates to a perfect hiding spot for their buried treasure. According to a recent newspaper article, How I Became a Pirate has been on the New York Times Children’s Picture Book Bestseller List for nearly six months now, and I can think of no book more deserving. Also mentioned in the article is the author’s intention to write a sequel. This is certainly fantastic news – this book is an absolute delight, and I can’t wait to see what happens to Jeremy Jacob and his pirate friends next. This entry was posted in Books and tagged children, long, shannon by Bilgemunky. Bookmark the permalink. My kids love this book. They also have the sequel and enjoy it.